When you think of picnic food, do your thoughts run to macaroni salad and watermelon slices? Nothing wrong with those: they are great options. That said, there are ways you can jazz up a picnic, depending on your grazing audience. After all, a park date with your spouse might not suggest the same food choices in your basket as a park playdate with your kids and twelve of their closest friends. Great for family and friends: Keep it light and fresh. A bean salad, tomato salad or cucumber salad is easy to store and serve up anywhere. The advantage to vinaigrette based salads is there is less concern with spoiling, as you might experience with a mayo based dressing, in the full heat of summer. That said, if you’ve got one of those super coolers, and you don’t open the lid a hundred times, you’re favourite creamy macaroni salad is still a great picnic option. Don’t want to chance it? This macaroni salad recipe is delicious and has no mayo. Kick it up a notch for date night: How about an asparagus salad? Crisp and tasty, but just little more sophisticated. Just cook the asparagus in boiling water for 3 minutes, so that they are still crisp and put them in cold water to stop the cooking. Mix them with sliced grape or heirloom tomatoes, chunks of Bocconcini cheese, and rip in pieces of fresh basil. With a light vinaigrette that has balsamic vinegar at its base, you’ve got a different style Caprese salad! Or how about a mixture of sweet and savoury with a watermelon and feta salad? All you need is watermelon, feta cheese, thinly sliced red onion, a dash of olive oil and you’re done. Some people will add some roughly chopped fresh mint too! Try it! Just for the little ones: Fruit salad, with a mixture of local and exotic fruits, is a good choice. The less you have to peel and deal with at your picnic table, the better. Cut up mango, melons, grapes, and any kind of berries you like for an easy to munch salad that will keep until they’re hungry. Tip? Freeze the grapes before they go into the salad, to keep it all a little more chilled. Eating anything on a picnic is more fun and easier if you don’t have large chunks and don’t need forks and knives. Sandwiches are fine, but why not change that up and go for a little new twist on the standard fare, with emphasis on the ‘little’. Great for family and friends: Thai style salad rolls are always a crowd pleaser. You can make different types, depending on who likes shrimp, chicken or just veggies, and you can serve them in bite size chunks with a sweet and spicy dipping sauce. Mini quiches are also fun. Just take your favourite quiche recipe—how about spinach and mushroom quiche?—and use the tiny individual sizes shells from the frozen aisle instead of a full sized one. Voila! Or you can make two bite asparagus, ham and cheese cups! Make them with the biscuit base, or skip the biscuit for a gluten free version. Mini-frittata anyone? Kick it up a notch for date night: Veggie sushi! You can’t get more bite sized than that and you can even cheat and pre-order some from your local Japanese restaurant if you’re not up to the task of rolling rice, avocado and cucumber in sheets of nori yourself. Skip the fish and keep it safe to eat, even a few hours in. Cut up pita wedges and serve them with a trio of dips as a nice touch. A hummus, a red pepper dip, or perhaps another family favourite? Add a few cheeses and some charcuteries to get a real feast going. With a small cup of chilled pea soup or a spicy gazpacho in the mix, you’ve got a dash of class on a park bench. Just for the little ones: Use cookie cutters in cute shapes to make cute PB&J sandwiches for tiny hands! They’re so much more fun than just a standard triangle, with or or without the crusts. Another great one is falafel. Kids usually love these chickpea based balls of goodness and they can be eaten straight up with a little ranch dip or in a pita with some greens. Either way, it’s friendly food that kids of all ages can enjoy. What picnic would be complete without dessert? Great for family and friends: How about individual pies? Rather than bringing the whole pie and slicing it up onsite, each person gets their very own! That’s a nice way to celebrate the end of a great day. Apple, cherry, blueberry or pecan… whatever suits your fancy! Turnovers work very well in this capacity too. Kick it up a notch for date night: How about chocolate covered strawberries? Just make sure they’re well hidden with an ice pack over top of them so they don’t sweat too much in the summer heat. These make a portable, easy to prep in advance treat! Peaches soaked in sparkling wine is also delectable and can be enjoyed ‘under the radar’ at a picnic for two. Just for the little ones: You can’t go wrong with cupcakes. Even better if you bring a few tupperware containers of jelly beans, sprinkles and other decorations so each kid (big or small) can create their own masterpiece. And if you didn’t do a fruit salad for them, fruit kabobs are great and even better if they come with a chocolate dipping sauce. Fun food for a picnic, no matter the occasion, is fuss free. No need for serving platters and spoons: just a plate, possibly a fork and a good time for everyone present! 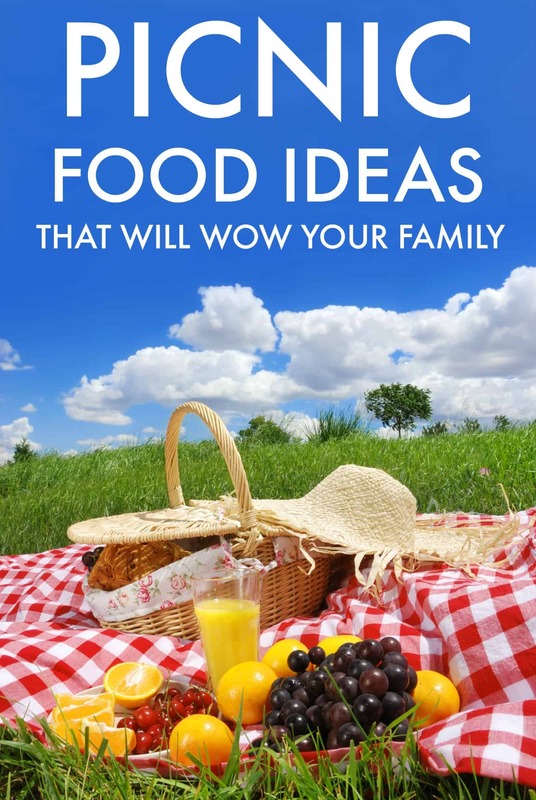 great tips, I love the cookie cutter sandwiches and frozen grapes as ice cubes.